In previous posts, we’ve looked at several factors for Operational Excellence, specifically related to your management system. We’ve established the need to have: an integrated system, a system that allows you to remain agile, a system designed specifically for your needs, and to structure your framework as a set of processes. This article looks at one of the most challenging fundamentals to accomplish, especially given how complex most organizations have become – keeping it all simple. Any set of rules or instructions is only of value if they are used, and to be used, they need to be simple. 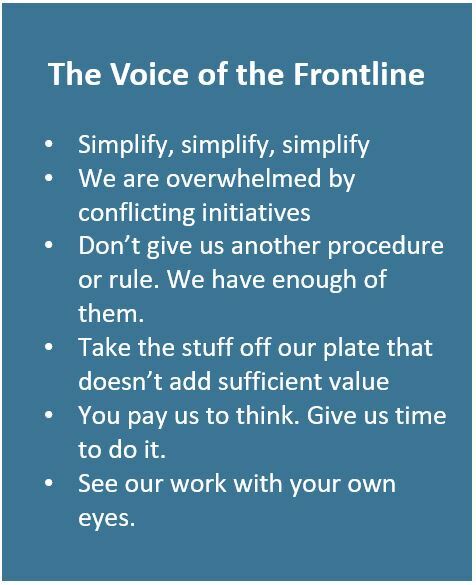 Keeping it simple is much easier said than done, and this seems to be one of the toughest challenges in making a system effective. The challenge is staggering. The US Federal Government has added about 4,000 new rules and regulations per year over the last 10 years. Add this to the ever-growing list of expectations from trade associations, standard setting bodies and customers. Combined, no single employee can keep track of every rule and expectation directing his or her job. This is why companies have management systems. But therein lies the catch – to get the results you expect out of your people, the management system must make it easier for them to do their job while meeting all requirements. The system should sort and filter all requirements, from regulators, industry and technical experts, senior leaders and external stakeholders, into a single set of instructions for any given task or role. In other words, the system should do the hard work and be simple enough to use. Many of the integrated systems in use today have grown in both size and complexity to the point where their effectiveness becomes questionable. If the system is too complex, it either becomes a paper exercise or sits on the shelf. One of the keys to making the system effective is to keep it simple. Whether you are starting from a blank sheet designing a new system, or you are looking to improve the effectiveness of your current system by simplifying it, the follow these three rules. Too often we encounter well-intentioned management system teams that point to the number of documents they’ve created as evidence of progress. It’s not uncommon to see companies with hundreds of policies and thousands of standards and procedures that sit on the shelf and go largely unused. These two symptoms usually go hand-in-hand. The management system is not just a conduit to communicate rules, it needs to synthesize them into the smallest set of rules in the simplest, most useable form that will achieve compliance and risk management needs. This is the difficult part as this requires negotiating and compromising between normally siloed groups to sort through conflicting needs or redundant instructions. This may sound harsh but it’s the truth. The only ones who really care about the management system and how sophisticated it might be are those who create it. The front-line doesn’t care. They just want to know what is expected of them. The more we complicate this by dispersing these instructions across multiple documents, the more you complicate it for them. Therefore, keep the document hierarchy and structure simple and clear. Be overtly specific about the role of all document types within your management system. For instance, what is the purpose of a policy vs. a standard vs. a procedure. Make sure that if someone picked up any document in your system, they could easily know if and when to follow its instructions. And finally, be clear within your governing documents about what is an expectation and what is a recommendation. If your current system seems overly complex or feels like a check-the-box exercise, Endeavor Management can help. Our extensive experience creating simplified management system allows us to quickly pinpoint ways to drastically simplify your system while improving its effectiveness. Contact us today to find out how you can simplify your management system.